Fireworks are a ripoff. The best-looking ones cost at least $50, and they’re over seconds after they begin. Sure, in those precious few seconds, the sky is ablaze with a wall of brightly colored fireballs. Afterward, the only thing burning is your desire to have done anything else with that $50. 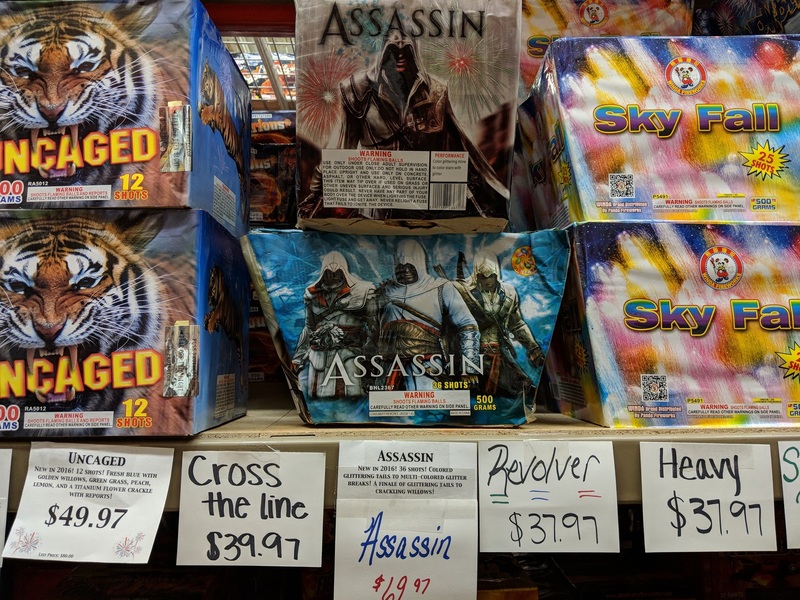 But fireworks rip off, too — as in a verb. They blatantly steal copyrighted images and slap them on the side of their boxes. Honestly, it’s pretty great. I’m in love with the idea of franchise allegiance being so strong that someone buys the Gears of War fireworks because it might be more Gears of War than all the other fireworks. That’s insanity. Here are a bunch of examples that I found at ONE fireworks stand in North Dakota this past weekend. Most are video games, but some are from games-adjacent things like comics. Enjoy the Fourth if you’re here in the You Ess Ayy. And remember: Good friends buy lots of fireworks; smart friends let their dumb friends do the buying. Everyone gets to enjoy it all the same.